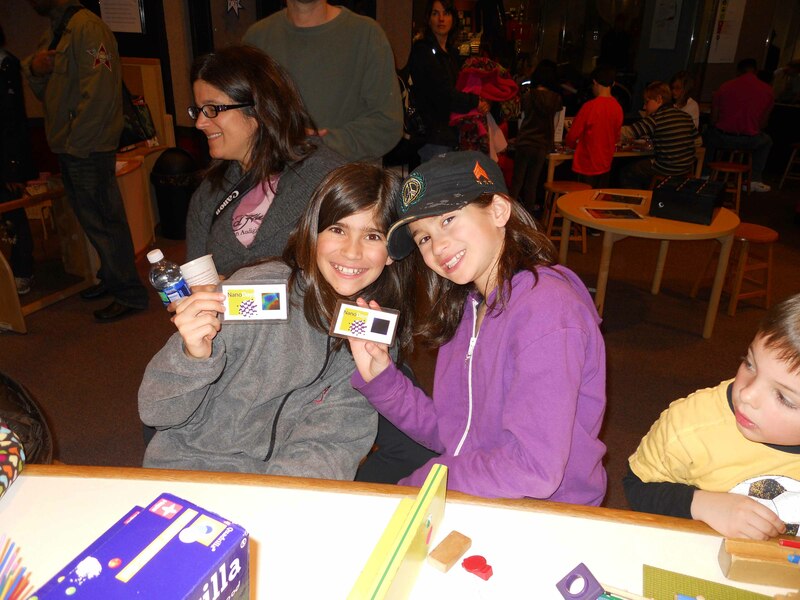 On Saturday, March 23, I had the wonderful opportunity to participate in a special evening program called “Girls Get Science,” which was sponsored by The Great Adventure Lab and took place at the Jewish Community Center of Greater Washington in Rockville, MD. The other panelists included my Smithsonian colleague Dr. Marguerite Toscano, a marine scientist and paleobiologist at the National Museum of Natural History, and Dr. Betsy Pugel, a physicist and electrical engineer at NASA’s Goddard Space Flight Center. The audience consisted of about 40 parents (some of whom are also teachers) from the DC metro area with about 40 of their daughters who are in grades two through six. 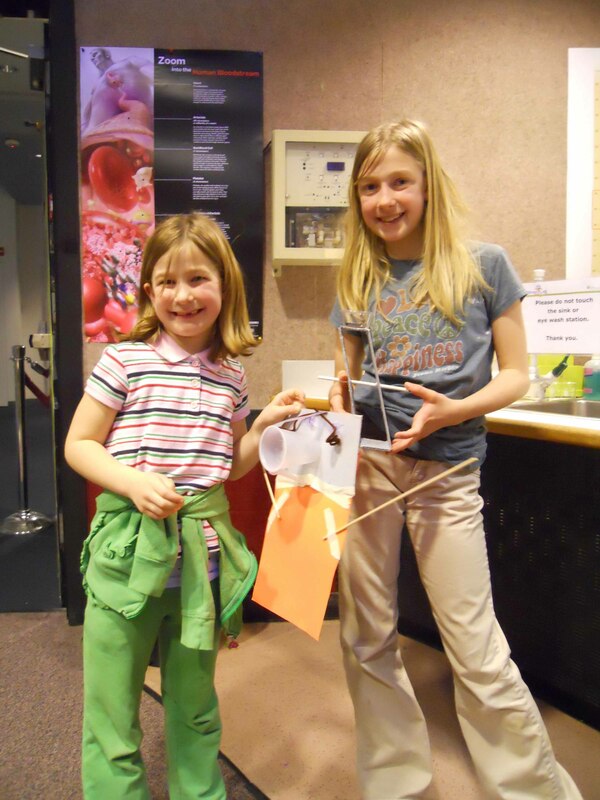 Girls participating in nanotechnology activities in Spark!Lab. The panelists and parents participated in a lively and thought-provoking 75-minute Q&A session facilitated by Great Adventure Lab president Joan Rigdon about how to support and encourage girls’ interest in STEM (science, technology, engineering, math) activities and possibly inspire them to pursue related careers. We talked a lot about the importance of having female role models (such as my fellow panelists!) from science, invention, and related fields. We also discussed ways to make STEM experiences more fun, social, interdisciplinary (including art, which makes it STEAM), and relevant to the “real world” to keep girls engaged through their teen years when typically their enthusiasm and participation wanes due to social and cultural pressures. While parents were discussing their potential futures, the daughters were in nearby classrooms totally engrossed in hands-on activities about basic robotics, video game programming, and engineering. Girls with robots invented during a Spark!Lab activity. After the official Q&A, the panelists and parents joined the girls to see their inventive creations and talk more one-on-one for about 45 minutes. Several parents told me they had loved spending time previously with their children in the Lemelson Center’s Spark!Lab and asked eagerly when it would reopen [answer: late spring 2015 when the National Museum of American History’s west wing first floor reopens]. A girl, about seven or eight years old I’d bet (a key age for budding inventors), came up to me and quietly shared that she had been working on an invention at home but it had failed. I explained to her that failure is an important, in fact essential, part of the invention process and all inventors have to fail in order to learn. Indeed Thomas Edison is quoted as saying, “I have not failed. I’ve just found 10,000 ways that won’t work.” Then I asked if she would go back to her invention and keep tinkering, and she said she would, she had a couple of ideas to try to make it work. While we were talking she was sticking a Spark!Lab pin onto her shirt very intently. Since the Lemelson Center was founded in 1995, we’ve had the great fortune of researching, documenting, and highlighting an array of amazing historic and contemporary women inventors. One woman at the “Girls Get Science” event came up to tell me she was proud to know already about Kevlar® inventor Stephanie Kwolek, who I mentioned during the Q&A as one of my favorite women inventors I had the opportunity to meet. It turned out she learned about Kwolek while visiting the Center’s Invention at Play exhibition that I worked on as the project historian and later project director. Kwolek is one of six featured case studies in the exhibition, along with stories of other women inventors including Marjorie Stewart Joyner, Sally Fox, and Gertrude Elion, Patsy Sherman, Ruth Foster, Krysta Morlan, Ann Moore, and Lydia O’Leary, and Annetta Papadopoulos of the IDEO team. The Lemelson Center is always looking for more and different stories from and about women inventors and is interested in documenting them throughout American history. If you have stories to share, let us know. Happy women’s history month!